It's time for another few words from our friendly Blueprint Earth co-founder, Jess! Hi BE fans! I wanted to tell you a bit about what it takes to make a science nonprofit tick. Of course we're in the midst of preparing for the upcoming field seasons (November 21-24, and a few in January, February, and March), our elementary science program is about to launch, we're preparing to present research at the American Geophysical Union fall meeting and the Geological Society of America conference, and we're still processing our data from the last few field seasons! In addition to all of that, we're taken up hunting. Before you get worried that we've lost our environmental marbles, let me clarify: we're hunting grants! Most people know that nonprofits can get money from several sources, including private donations, corporate donors, and the government. What you might not know is that writing winning grants actually is a real skill, and one that is fairly difficult to figure out without some inside info. When we founded Blueprint Earth, I viewed grants as something that would just happen naturally as we began to produce good quality science. I was looking at running a nonprofit as a scientist who just happened to work in the nonprofit world, rather than as a nonprofit leader who just happens to run a science organization. That was a completely backwards way to look at things, as I found out! Fortunately, there are resources out there for learning about grants and how to find, assess, and write them. I actually attended the Project Grantsmanship workshop put on by The Grantsmanship Center just a few weeks ago. 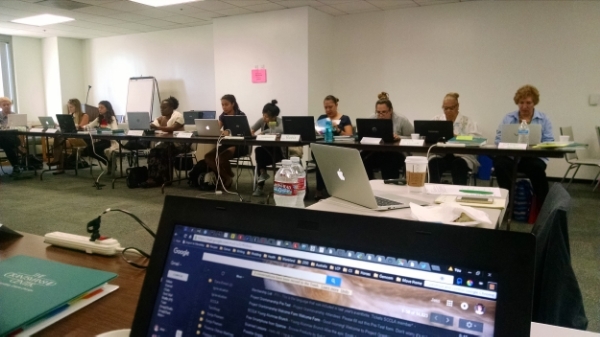 The quality of the program was phenomenal, and it allowed me to connect with other nonprofit leaders in Los Angeles. This was something that I had never done before, since I come from the science world. I know scientists already! I didn't have as good of an understanding of the L.A. nonprofit scene, and believe me when I say that there's a ton to learn. It was a great reminder to always be open to looking through a different lens than the one that fits you most readily. We were all super psyched to get going! Also, I may have a browser tab problem.